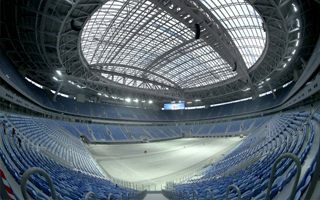 In just a few days the very first event at Zenit Arena will take place. It’s almost hard to believe after we’ve watched this construction go on for a decade. But indeed, on February 11 a semi-open public tours of the stadium will be carried out. “Semi-open” because capacity is capped at 10,000 people and only lower stands will be available. This community event is the very first test Zenit Arena has to undergo in order to be considered safe for daily operation. Second test will come on February 22, when 35,000 people are expected under the closed roof. This time for a concert organized by Radio Zenit, though still with only the lower stands available. Such tests, organized somewhat hastily, are required in order to get the 68,000-capacity stadium ready for June’s Confederations Cup. Interestingly, opening its doors doesn’t mean that Zenit Arena is complete. Formally it was handed over to the municipality on December 30 but in practice the general contractor received additional contract and is still present on site. Even if remaining works are minor at best, when compared to the immense scale of the stadium, all of the venue and its surroundings won’t be ready before May 1. There are also several problematic issues left to work on. First one is the flexibility of the field. In late 2016 it’s been deemed unfit for play by FIFA due to instability of the turf. work on stabilization is expected to be carried out in February. Another issue is the retractable roof. Two halves of Zenit Arena’s dome are fully operational at this point, but only manually. The operation has to be fully supervised and there is no system in place that would allow for more automatic closing/opening. And finally, the stadium cost remains unclear. Just last week Saint Petersburg representatives confirmed the budget to be RUB 41.7 billion (at present $710 million), but this stands in contrast with independent reporting by Fontanka.ru, who counted contract fees and came up with 48 billion. Most likely scenario is that none of these numbers will prove correct as former contractors and investors are fighting in court over billions.